Fair Hill, Md. – The show jumping phase proved influential for CCI3* competitors on Sunday at the 2017 The Dutta Corp. Fair Hill International Three-Day Event, with Will Coleman and Tight Lines claiming the title of The Dutta Corp./USEF CCI3* Eventing National Champions. Tamra Smith and Sunsprite Syrius remained unaffected by the challenging show jumping phase to close out a start-to-finish win of the CCI2* division. In the CCI3*, the leaderboard shuffled to put Canada’s Selena O’Hanlon and Foxwood High on top as the winning pair of the 2017 The Dutta Corp. Fair Hill International Three-Day Event. It was a rollercoaster weekend for O’Hanlon (Ontario, Canada), as she bounced from first to second and back on top again with Foxwood High, a 14-year-old Canadian Sport Horse gelding owned by John and Judy Rumble. Ultimately, the CCI3* win and a $15,000 prize were hers for the taking after she added three deliberate time penalties in Sunday’s show jumping to finish on a score of 44.0. Coleman (Charlottesville, Va.) and Tight Lines were crowned The Dutta Corp./USEF CCI3* National Eventing Champions and second overall at the 2017 The Dutta Corp. Fair Hill International Three-Day Event after a faultless show jumping round left them on their dressage score (46.3) as the highest placed American pair. As the national champion, Coleman will also receive one free, round-trip flight to Europe, for one horse from The Dutta Corp.
A clear round catapulted Boyd Martin (Cochranville, Pa.) and Christine Turner’s 10-year-old Trakehner gelding Tsetserleg to third place in the CCI3* for The Dutta Corp./USEF CCI3* reserve champion title. A score of 46.1 in the dressage and 1.2 time penalties on cross-country gave them a final result of 47.3. Smith’s (Murrietta, Calif.) show jumping trip proved successful on Sunday as she completed a wire-to-wire win in The Dutta Corp./USEF CCI2* Eventing National Championship with Sunsprite Warmbloods’ Sunsprite Syrius. The nine-year-old Trakehner gelding ended the weekend on his dressage score of 40.9. “I’m thrilled. He was perfect in every phase, and I couldn’t have asked him to be better. 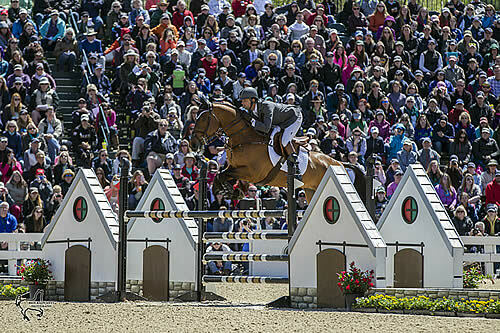 He show jumped today like a million bucks,” Smith said proudly. Coleman and Off The Record moved nimbly around Sally Ike’s winding show jumping track to finish in second place in The Dutta Corp./USEF CCI2* Eventing National Championship. The Off The Record Syndicate’s eight-year-old Irish Sport Horse gelding avoided jump penalties throughout the weekend for a final result of 49.8. Matthew Flynn (Reddick, Fla.) and Get Lucky, a nine-year-old Dutch Warmblood gelding owned by Flynn Sporthorses, steadily climbed the leaderboard through all three phases, ending the competition in third. Only 0.4 cross-country time penalties marred their finishing result of 50.4. Get Lucky was also awarded the Best Presentation Award. The John H. Fritz Trophy was awarded to Sophia Click as the highest-placed Young Rider in the CCI2* division. Nina and Tim Gardner’s FE Lifestyle, a seven-year-old Warmblood gelding, earned the USEF National Young Horse Championship title for six- and seven-year-old horses. The Small But Mighty Award was given to Colleen Rutledge’s (Frederick, Md.) 11-year-old Irish Sport Horse mare Uno for being the smallest equine to complete the CCI2*. For further information on The Dutta Corp. Fair Hill International, visit www.fairhillinternational.com. Elkton, Md. – The final day at The Dutta Corp. Fair Hill International saw National Champions crowned in both The Dutta Corp./USEF Three- and Two-Star Eventing National Championships. Taking on the Sally Ike-designed show jumping course, 56 combinations contested the final day of the CCI2*, while the CCI3* saw a field of 37. Winning her first USEF National Championship title, Tamra Smith and Mai Baum led from the start and secured the win today in the CCI3*. Also maintaining the top spot on the leaderboard throughout all three phases, Will Coleman with Tight Lines took the win the CCI2*. Smith (Murrieta, Calif.) and Mai Baum began their weekend with a beautiful performance in dressage to score 38.5. After an impressive trip around the cross-country track, the pair added nothing to their overnight score and began the day with a rail in hand. 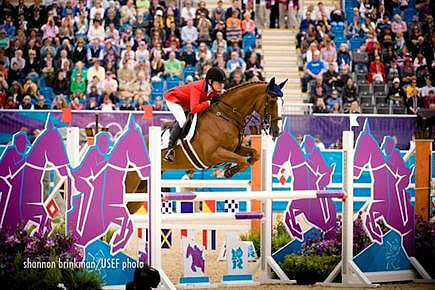 Having won in her last three outings with the 2006 German Sport Horse gelding owned by Alexandra Ahearn, Ellen Ahearn, and Eric Markell, the pressure of the lead did not affect Smith as she executed a bold and careful show jumping round, adding two time penalties to finish on 40.5. This was Smith’s first CCI3* win and National Championship title. As the top-placed rider to have not completed a CCI4*, Smith was named the USEF National Developing Rider Champion. Smith received a horse transport flight courtesy of The Dutta Corp. as the three-star National Champion. Phillip Dutton (West Grove, Pa.) and Mighty Nice had a solid dressage test to begin the weekend on a score of 43.5. Displaying their signature prowess on cross-country, the pair finished double-clear without a second to spare, clocking in on the optimum time of 10 minutes. The 2004 Irish Sport Horse gelding, owned by Michael Bombar, Evie Dutton, Ann Jones, Kevin Keane, and Caroline Moran, rubbed several rails, but left them all in the cups, adding two time-faults to the overnight total to earn the Reserve Champion honors. Finishing third was Kim Severson (Charlottesville, Va.) and The Cross Syndicate’s 2007 Irish Sport Horse gelding Cooley Cross Border. The pair added just eight-tenths of a time penalty to their dressage score in cross-country, going double-clear today to climb the leaderboard one spot and finish on 46.6. It was an exciting conclusion to the CCI2* as less than a rail separated the top three combinations. Heading into the arena as the overnight leader, Coleman (Gordonsville, Va.) and Tight Lines finished clear and inside the time allowed to secure victory. The pair had started off their weekend with a best-ever performance in the dressage phase, scoring 42.5. The 2007 French Thoroughbred gelding, owned by The Conair Syndicate, built confidence all the way around the cross-country track on Saturday, going double-clear in impressive fashion. Taking another Reserve Champion title today was Dutton and Z, adding a double-clear show jumping round to their double-clear cross-country performance to finish on their dressage score of 45.3. The 2008 Zangersheide gelding, owned by Suzanne Lacy, Jacqueline B. Mars, Simon Roosevelt, and Thomas Tierney, showcased his potential to excel in his first CCI2* contest. Z was also awarded the USEF Two-Star Young Horse Eventing National Champion title as the highest placed six- or seven-year-old horse. Climbing the leaderboard from eighth after dressage and fifth after cross-country, Matt Flynn (Reddick, Fla.) put in a brilliant double-clear show jumping round to take third place overall on a score of 48.8 with Flynn Sport Horses LLC’s Get Lucky, a 2008 KWPN gelding. 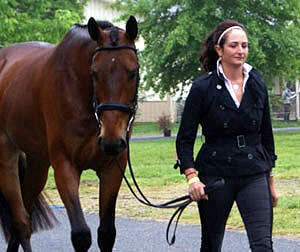 Get Lucky was Reserve Champion in the USEF Two-Star Young Horse Eventing National Championship. Adrian Jones, riding Magnificent Toy, won the USEF Two-Star Young Rider National Championship, placing 24th in the CCI2*. Madeline Backus and P.S. Arianna were the Reserve National Champions. Lexington, Ky. – The Rolex Kentucky Three-Day Event presented by Land Rover came to a conclusion this afternoon as 41 combinations went head-to-head over Richard Jeffery’s show jumping course inside Rolex Stadium at the Kentucky Horse Park. Michael Jung of Germany rode the impressive mare, fischerRocana FST, in yet another foot perfect jumping effort to win the title of Rolex Kentucky Champion on their dressage score of 39.3. Overnight leader Tim Price of New Zealand and Wesko had an extremely costly rail down to finish a close second on 40.3. Jung also took third place honors with La Biosthetique-Sam FBW who had two uncharacteristic rails down on course to finish on 44.7. Earning the Rolex/USEF CCI4* Eventing National Championship title was highest placed American Phillip Dutton with Fernhill Cubalawn, owned by Thomas Tierney and Simon Roosevelt. The pair went clear and inside the time to take fifth place on 54.1. Going earlier in the order, Dutton rode a flawless round on Fernhill Fugitive, owned by Thomas Tierney and Ann Jones, to finish ninth on 59.3. Dutton was the only rider in the field not only to saddle two mounts on Sunday, but to ride both to double clear finishes on a day when clear efforts were scarce. Making this achievement more special is the fact that both horses were contesting their first CCI4*. This marks the fourth time Dutton has been named the Rolex/USEF CCI4* Eventing National Champion having won the title in 2010, 2008, and 2007. Will Coleman and OBOS O’Reilly, owned by the Four Star Eventing Group and Coleman, added four faults to their dressage score with a rail down at fence five to finish sixth on 56.6. Boyd Martin and Master Frisky, owned by Stephen Blauner, also ended the day on 56.6, but placed seventh behind Coleman as the classification is decided in favor of the athlete whose cross-country time was closest to the optimum time. Coleman finished his double-clear cross-country ride just one second under the optimum time. He was presented with two-year free lease on a 2015 Land Rover Discovery Sport having won the Land Rover Best Ride of the Day Award. The complete competition is available on-demand on the USEF Network, in addition to complete results, post-ride interviews, and daily recaps from today and throughout the week. Take a sneak peak at who is already preparing for the trip to Rolex Kentucky this year. Whether it is their first time to Rolex Kentucky or not, each tale is unique and inspiring to follow. Read more about your favorite horse and rider in this week’s featured riders installment! I’m sure most people can recount their first Rolex visit. For me it was in 2003, when the torrential rain flooded the course. I was 14, I believe, and I was quite fortunate to be Allison Springer’s first working student at the time. Click to read more about Jennie! Greenwich, UK – The German Olympic Eventing Team was in a class of its own as history was made at Greenwich Park. Michael Jung led a charge that finished with him winning Team and Individual Gold in a flawless effort on Sam. They were the only combination to finish the entire competition without adding anything to their dressage score. That score of 40.6 meant that Jung is the first person ever to be the reigning European, Olympic, and World Champion simultaneously. Sara Algotsson Ostholt led after the cross country with Wega for Sweden but her Gold medal turned to Silver when they impossibly dislodged the front rail of the last fence of the individual show jumping round. It appeared to happen in slow motion. Sandra Auffarth bookended the German effort, picking up Bronze on Opgun Louvo. Just 4.2 faults separated the top three individuals. The German invincibility began its display in the Team competition; they finished on a three-day score of 133.7, handling everything the British could throw at them. The Brits gave it a serious effort before a hugely supportive crowd, but they finished up Silver on a score of 138.20. New Zealand rounded out the top three with class performances from all five of their riders. The U.S. Team finished seventh on a score of 208.6. 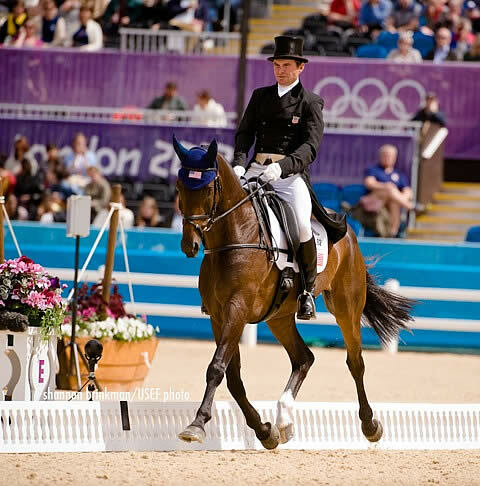 Greenwich, UK – The Olympic Eventing dressage concluded today and the U.S. put in two strong performances to settle into seventh place after the first phase. The Germans have a commanding lead on a combined score of 119.10, just clear of Australia on 122.10. The home team sits third on 127. The next five teams are separated by less than 11 points, meaning that Monday’s cross country is destined to be influential. Phillip Dutton (West Grove, PA) leads the way individually for the USA. He rode Jim and Arden Wildasin’s Mystery Whisper to an impressive performance – scoring 44.1 for the effort and into 19th place. Judged by Anne-Mette Binder, Nick Burton and Gillian Rolton, Mystery Whisper had small mistakes in each halt, the first one preempted by a spook going around the main arena, but was otherwise all class.